Click to print. View individual events below to add to your calendar & share on your social channels. It’s time to celebrate the 2018 WEGO Health Awards! Each year we hold a virtual ceremony that allows Patient Leaders from all over the globe to get involved. 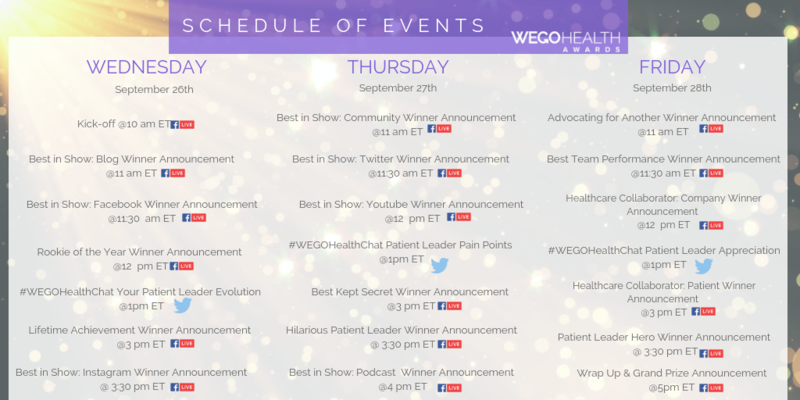 This year’s WEGO Health Awards virtual ceremony will be held September 26th – 28th, 2018. From Australia, England, Nigeria, United States and everywhere in between – we invite ALL Patient Leaders to take to their social media channels and get involved! WEGO Health Facebook page, connect with others during #WEGOHealthChat over on Twitter and win BIG (trip to Connected Health Conference BIG) by participating in our giveaways! Click on each event to learn more details, add to your calendar and share on your social feeds! 26sep10:00 am10:30 amKick OffIt's time to kick-off the 2018 #WEGOHealthAwards! Join us for a Facebook Live on the WEGO Health Facebook page as we kick off the 2018 WEGO Health Awards! Join us for a Facebook Live on the WEGO Health Facebook page as we highlight the finalists of this award category and announce the 2018 WEGO Health Award Winner. Whose blog do you absolutely love? Who has the best information, is raising awareness and going the extra mile for patients and caregivers? Which blog do you believe is exceptional and really raises the bar? This Patient Leader may be active on numerous social platforms, but their blog is the bread and butter of how they advocate. The winner of this category embodies the essence of what a great blogger should be. Award Description: Facebook is a community all its own. Over the past few years, it has transformed from a place for a personal profile to a real hub for discourse, conversation, and community. Who has the best Facebook Group or Page of anyone you know? Who utilizes Facebook Lives to amplify their patient advocacy? The winner of this category has balanced the ever-changing interface of Facebook and has turned it into an opportunity to reach more people. This Patient Leader fosters an environment where people want to “Like” and interact. They may have other social media sites, but he or she really utilizes all the tools Facebook has to offer and shows how it can be used for good! Award Description: Every year, more and more health bloggers are excited by empowerment, raising awareness, and helping others. This particular Patient Leader just started their blog, site, or community work this year and are already making a huge impact. Though they’re new to the scene, they show a ton of promise and are, without a doubt, going to do amazing things in the future. Who is your favorite new Advocate? Who is someone you can see rising above and making an impact in the online health space? Let’s give them the encouragement they need to keep putting in the hard work! Join your fellow Patient Leaders for a #WEGOHealthChat to discuss hot topics within the community. We all started in different ways. Some Leaders had their start offline years ago, others started with foundations and others started with a blog that morphed into something bigger than they could have ever expected. However you started, we’d love to talk about your journey! How did you start? Who were your mentors along the way? How do you go about connecting and building yourself up? Let’s spend the hour talking about your own evolution and learn from other Patient Leader’s journeys as well. Our fellow counterparts in other condition areas can share what worked, what didn’t work and how we can all learn from each other in this arena! Award Description: Year in and year out we come across Patient Leaders who continue to rock the health world. Which leader do you believe needs to be recognized for their overall achievement over the years? These Patient leaders are true stars who continue to shine and don’t fit into just one category. Let’s face it, they’ve done it ALL! Perhaps they even started their advocacy before Twitter… gasp! Think of this category just like the Lifetime Achievement Award at the Academy Awards. Let’s recognize those giants of Patient Leadership that have stood the test of time. Award Description: A picture is worth a thousand words. A cliché perhaps, but none the less true. Curating an Instagram gallery is no small feat! The Patient Leader in this category utilizes Insta-stories and visuals to connect and drive engagement with their community. Who do you believe is using Instagram for a higher purpose? Who is invoking community, raising awareness and driving forward change? The Best in Show: Instagram winner is the Patient Leader who tells their story, and the story of countless other patients, through thought-provoking and engaging images. Award Description: Who has created an amazing online community or threaded forum that houses important conversations about health? Through either their own site or an open online space, they bring people together. Their leadership takes the form of active community management, engagement, and moderation. They’ve mastered the art of creating an inviting space for newcomers while still keeping a safe space that people have come to respect and rely on. This is a community or forum you’d recommend to new patients and family members or friends because it has it all. Moderating and managing health-related conversations can be draining, so let’s reward them for all of their hard work! Award Description: It’s not easy doing amazing things in only 140 characters – but there are some leaders who truly excel at it. Creating easily digestible thoughts can be difficult with health stories and research! Who’s tweets do you always go looking for? Which accounts are your favorite to follow? Who hosts your “can’t miss” twitter chat? Let’s celebrate those using Twitter for their advocacy with an award! Whether they’ve created their own Twitter chat, participate actively in others’ chats, push out words of encouragement or are there for support – they are the model of Twitter for #health. Award Description: Give the people what they want – VIDEO! Bloggers and social media mavens all know that if you’re not creating video you’ll be left behind. We’re looking for the brave Patient Leaders who star in videos as a way to connect with fellow patients and caregivers. They’re creating how-to videos, describing their day to day lives, highlighting others and showcasing their advocacy works. You feel connected to them, and to their cause because their videos are so engaging and well put together. Who is your favorite YouTube rock star? Who do you believe should be recognized for their contributions to the online video community? They might not win an Oscar for their acting skills, but we can honor them with the WEGO Health Best In Show: YouTube Award! There are many obstacles and challenges that Patient Leaders face while advocating for their condition. We’re calling the WEGO Health Patient Leader Network together to talk about your own pain points. We’ll work through how you are (or are not) overcoming these challenges and how we can help each other out. We’ll leave this chat revved up with connections to help us break through the walls that are confining us and make a difference in the world! Award Description: The internet is a vast place, making it near impossible to find all of the amazing content that exists. We find ourselves continuously turning to our Patient Leader Network to help give us recommendations of the who we should follow! Who do you believe is a hidden gem? A Patient Leader who creates great content and should have the spotlight shone on them? Who deserves double the readership because they are doing great things as an advocate? Help us uncover the best-kept secret of the online health space! Award Description: Advocacy doesn’t have to be all business and raising awareness doesn’t have to be all work. The truly funny Patient Leaders among us bring a lightness to the online health community. They address serious subjects with humor – and we love them for it. They may be witty, sharp, dry, or just have a way to tell a story that is truly funny. Is there someone you go to for chuckles on a bad day? Who’s blogs or tweets do you read and always laugh? Let’s celebrate their style and thank them for cracking us up when we need it most. Award Description: Your earbuds are in and you’re ready to hit play. Who’s podcast are you listening to today? So many Patient Leaders are taking to the airwaves to tell their stories. Through these online audio shows, listeners can take these Patient Leaders with them where ever they go! Which podcasts can’t you stop listening to? Who has the best guests? Who’s content has inspired you to take action? These podcast hosts leave us feeling great and get our wheels turning. Let’s celebrate their hard work and show them their audience is listening by awarding them with the WEGO Health Best In Show: Podcast award. Award Description: There are many reasons why Patient Leaders get involved in advocacy. This particular group of advocates has a special inspiration: their loved one. Though these advocates may not personally experience a chronic health condition, they tirelessly raise awareness and have an up-close-and-personal perspective that is invaluable. They are caregivers of children, siblings, parents, significant others, or friends. These Leaders work hard to make the world better for patients like their loved one. Not only do they dedicate their time caring for someone in-person, they also support others in the online health community through their blogs, sites, and social media presences. They truly prove that caregivers and parents need to be at the table alongside patients when it comes to changing healthcare for the better. Who would you like to recognize for their above and beyond advocacy for another? Award Description: Advocating doesn’t have to be a one man/woman show. This award is for those teams who work better together. Whether it be a group that runs an online chat, a non-profit organization, or a caregiver and patient duo – this award is for a team that takes their activism to new heights because of the assistance from one another. Nominate those teams for this award instead of having to choose who to single out from a team effort. Award Description: Healthcare companies are looking to collaborate with patient leaders who can bring “real-world” experience navigating the complexities and challenges of their condition as well as the healthcare system. Many don’t know where to start, but a few stand out as making a real difference. These non-profits, foundations, agencies, pharma companies, health plans and healthcare innovators deserved to be praised for their dedication to listening and incorporating Patient Leaders. They truly understand that patients are so much more than their insights. As a Patient Leader, who do you see as standing out amongst the crowd? Who do you wish others would model after? Let’s celebrate these leaders who utilize Patient Leaders to help transform healthcare! Let’s take the time to thank other Patient Leaders for their support and help. During this #WEGOHealthChat we’ll talk about others who have greatly impacted you on your journey and give them public shout outs!! Award Description: Speaking at conferences, consulting with healthcare companies, using their education to help make a change in the healthcare industry, creating apps and products to fulfill needs in the current system – this Patient Leader is bridging the gap between industry stakeholders and healthcare consumers. These Patient advocates and influencers are passionate about healthcare and bring their skills and expertise to bear on a range of industry challenges. They understand healthcare from the patient perspective, but they are also professionals with the skills and expertise to help companies advance their most critical patient-facing initiatives. Who is someone you know out there working within the industry to make change? Which Patient Leader lights up the stage at industry conferences? Do you know someone who has created an app or device that has revolutionized the way a patient deals with their condition? Which Leader is making an impact, not only among patients but on the healthcare landscape as a whole? Award Description: Sometimes the connections we make in online communities go above and beyond, truly changing our lives for the better. Which Patient Leader has content that has opened your eyes to see things a different way? Who’s dedication has ignited the advocate within you to make a change? And whose work has accomplished change for their community members? This Patient Leader’s influence truly has the impact to make a difference. They’re nothing short of a hero! Make sure to nominate the Leader you truly believe embodies the spirit of a healthcare influencer. 28sep5:00 pm5:15 pmGrand Prize Announcement & Wrap UpJoin us for one more Facebook LIVE to recap the celebration and to announce the grand prize giveaway winner! Join us for one last Facebook Live during the WEGO Health Awards celebration! We’ll be recapping the entire celebration and announcing the winner of our grand prize giveaway. Remember, just because the celebration is over, doesn’t mean the connecting needs to stop! We’ll share simple ways you can stay connected with fellow Patient Leaders all year long. 2018 WEGO Health Awards Finalists and Nominees.